Dimmable light bulbs can be used in conjunction with a light dimmer. A bulb's base determines what socket it will work with. It is important to take note what base your light fixture uses as certain bulbs such as MR16 are offered with different bases. CCT defines the color appearance of white light, which is measured in Kelvins. Color temperature can be described as warm, neutral, cool, and daylight. Lumen output or "Lumens" is a measure of the total amount of visible light emitted by a light source. All light bulbs are divided into series and sizes based on the fixtures they fit in. For example, A19 bulbs are the most common bulb shapes found in lamp fixtures. CRI measures the ability of a light source to accurately render the colors of objects. Industry certifications that represent safety, environmental, and performance standards. 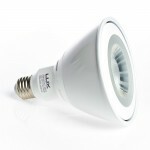 LUX TG A19 LED Bulb, E26 11W (75W Equiv.) - Dimmable - 300 Deg - 3000K - 1100lm. 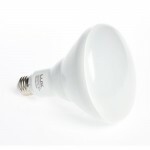 LUX TG BR40 LED Bulb, E26 17W (100W Equiv.) - Dimmable - 110 Deg - 3000K - 1400lm. 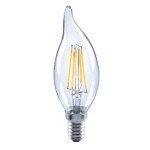 LUX TG Candelabra LED Bulb, E12 4W (40W Equiv.) Non-Dimmable - 2700K - 350 Lm. 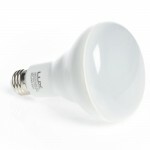 LUX TG A19 LED Bulb, Filament d E26 6W (60 Watt Equiv.) Non-Dimmable - 2700K - 810 Lm. 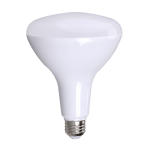 LUX TG PAR38 LED Bulb, E26 17W (120W Equiv.) 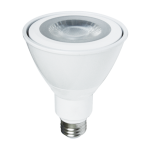 80 CRI - Dimmable - 3000K - 1200 Lm. Light bulbs are the most essential parts of any lighting fixture that is why you need to pay additional attention when selecting them. The following guide will help you make the best choice among hundreds of options that exist today. Fluorescent bulbs. Such type efficient and long-lasting and is traditionally used with residential and commercial ceiling fixtures. CFL bulbs. This is the type of compact fluorescent lamps that use a mixture of gases to illuminate the area. Such bulbs are able to retain their heat and thus light when heated, this is why they provide more light while using the same amount of energy. Incandescent Bulbs. 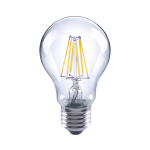 Incandescent bulbs are the oldest and least efficient type of light bulb that is still commonly used because of its low and affordable price. Such light bulbs spend 30-40% more energy than fluorescent and in addition to that have a shorter life. LED bulbs. Are the most efficient, reliable and long-lasting bulbs that exist today. 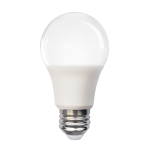 The LED technology emits light while electrical charge passes through the bulb. The scope of LED bulbs is wider than you think; they are used in most of the residential, commercial and even industrial light fixtures. Halogen bulbs. This type of bulb is the closest you will ever get to sun light. It offers a natural colored light that is very similar the one produced by sun. Such light bulbs are mostly used for decoration purposes. After the type of your future light bulb is specified, you need to consider its shape. The shapes that are present at today’s market include a-line, spiral, globe, candle, tube, bullet and other. Each shape has benefits and fits particular light fixtures and installations. Bulb base should also be considered before you buy the item. 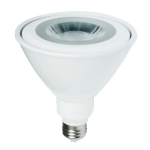 The best way to know if the base is compatible with the lamp or the fixture is to look for specifications of such device and compare them with the bulb’s description. Wattage and color temperature of a light bulb should also be considered. Knowing the wattage of each bulb installed in each fixture will help you plan your budget and, surprisingly enough spend less money and energy. Color temperature or the light’s color only depends on your personal preferences. It is possible to find bulbs of every type with warm or cool colors; you only need to look for such information in the light’s description.